We have just returned from TISE, The International Surface Event in Las Vegas (formerly known as Surfaces). The show features an extensive display of floor coverings, natural and engineered stone and tile products. While it used to be a major hub for carpeting and area rugs, our team noticed that the hard-surface arm at TISE dominated the Jan. 18-20, 2017 event. Still, our carpeting experts, Sally Gordon, Cliff Davis and Karen Lawrence have some interesting observations to report. Growth in the once-niche, hand-loomed broadloom category was strong, according to our pros,with each of the high-end mills coming out with their own versions in wool and wool blends. We’ll continue to track this product and report back to you. 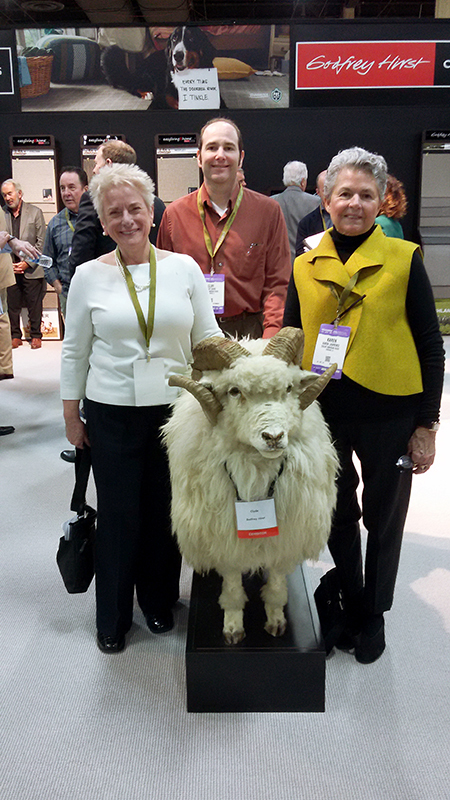 Natural, undyed wools continued to flourish in broadloom lines at the 2017 show, said Cliff Davis. “Three years ago, this product was just emerging and now it is coming into its own,” he said. While the big firms all had strong representation, as you’d expect, Karen Lawrence noticed several smaller vendors who brought unique products to the show, including a leather rug collection at one firm made of upcycled leather belts and handbags. TISE takes place each January at the Mandalay Bay Convention Center, attracting industry suppliers that showcase the latest products in the flooring industry. As always, we remain committed to being on the frontlines of the industry, noting even the subtlest changes in an effort to keep you informed.